(October-Early November, 2013) The Alpha Male came early the next morning with a bowl of food and water. I ate hungrily, lapped up all the water, and was let let out into a dog run in the large backyard. Several other dogs, some my size, others much larger, were already out there. I walked warily around, sniffing, ready to mix it up, if need be. But the other dogs weren’t looking for a fight. Everyone did their business, and we were herded back inside the house. We were crated, then brought out to work, first individually, then in groups. I was with a pack of large dogs and huge German Shepherd police training dogs. These shepherds were half my age and twice my size already! I figured I’d better watch my step and keep my hair down. From that day on it was work, work, work. Sit. Stay. Heel. About turn. Back. Down. Recall. Figure 8. Finish. All the commands I had learned in Obedience school, over and over and over. Then bang! Into the crate, another biscuit, and lights out. Mom still did not come to get me. I knew I’d been booted out for good. I was devastated, but felt the need to survive. Soon, other elements were added to my days of never-ending training: invited to jump on the couch or counter, I was then met with a loud noise and a sharp, “Off!” This applied to chairs and the beds, too. Sneakily, I decided to chew through my lead (the Alpha had switched it from the leather one to my regular, nylon one) but was unpleasantly surprised to find that it tasted indescribably awful! The Alpha had sprayed it with “Bitter Apple”. Yuck! What was worse, if I jumped repeatedly, or tried the old “Hairy Bullet” on the Alpha, he sprayed the noxious stuff into my mouth. Horrible! I soon straightened out in regards to chewing and Hairy Bullet-ing. It wasn’t all bad, though. My crate was actually my respite from all the other dogs. And exercise time was my favorite. The Alpha Male would hold a long plastic pole with a bit of fur connected to the end, and swing it all around. We dogs would jump and run and grab for that pole with our jaws, and then hang on for dear life! It was a lot of fun. I really got into good shape, too. That playtime was a terrific stress reliever after working so hard all day long. But I was lonely. There was no soft dog bed. No table scraps (in fact, he only fed me once, in the morning). No Jamie to say, “Hi, Mags!” in that sweet voice he uses. No Dad to greet when he comes home at darktime. And no Mom to curl up with on the human bed, her hand draping over my belly, cooing soft words if I twitched or stirred in the night. I told myself I had to get over it, that those days were gone forever. This was life at bootcamp. By now, you’ve probably read, “The Homecoming” and you know that my family DID come get me. And not just Mom or Jamie…the whole family came out to retrieve me. I’d just like to say a few words about this whole experience. I never want to go through this again! At home, life IS different now. Much more regimented. I sleep in the crate. I eat once a day. And several times a day, Mom or Jamie or both work with me on commands. Dad is putting an exercise pole like the one Daryl had together for me so I can get constructive play in the backyard. Also, they are going to tether me with a 30 foot-long lead in the back so that if I DO smell a rabbit, I WON’T bolt through the fence. That is, unless they make me a dog run. Mom thinks I’ll have more yard if we use the tether. I will not be left out all day, just for those times when I want to spend some time outdoors. When I’m supervised, I’ll be able to run around freely. Laurel still comes and gives me walks. She stopped by the morning after I came home to say hello, give me a couple pets, and go over commands with Mom. So all my instructions will be consistent. I haven’t barked once at the small dogs. Mom wants us to officially sniff n’ greet in the Forest Preserve. I do try to jump on the furniture, and today Mom had to spray the Bitter Apple in my mouth when I tried to destroy a new dog bed. We are all working on my behavior together. I was very unhappy to find out that 4 Paws Playhouse, the doggie day care that Mom wanted to send me to, has right on their website: “No American Staffordshire Terriers, Pit Bulls, or Akita type dogs are allowed.” We are all very upset about this Breed Discrimination. I don’t know how people expect dogs like me to get socialized if we are not given an opportunity to socialize. Kind of like needing experience to get a job, but no job will hire you to give you the experience you need (in human terms). It’s frustrating. I’m pretty sure I’ve gotten all caught up on the blogging I’ve missed. You have all had some wonderful blogs, and I’ve missed all of you dreadfully. You are my WP family, and when I say, “Woof!” I mean it. Sending each and every one of you a big tail wag, and a dogsmile. I’m so happy to be back! This entry was posted in Uncategorized and tagged doggie bootcamp, doggie day care, dogs, family, love, obedience school, Pitbull, thank you, woof, WordPress on November 16, 2013 by maggie0019. It’s been a weird two weeks without Maggie. I go pick her up tonight at 9:00. I know that is late, especially since I have to work on commands with the trainer afterwards, but I think the reasoning is that there is one more Obedience Class ending at 8:30 that she is scheduled to attend. The trainer wasn’t overly-communicative with me while Maggie was gone. All I know is that she was doing well and was a good girl throughout the process. I expect to have a lot more information later. Since Maggie hasn’t had access to a computer, she hasn’t blogged. I’d like to thank everyone who’s stuck with her during this time, though. I know she has a lot of blogroll reading and catching up to do. I’m sure Maggie herself will have a lot to say, and I’m looking forward to seeing how the next days and weeks develop. A couple have things have changed on the human front since Mags left: my son Erik moved back in and he brought 2 small dogs with him. They will be confined to the downstairs area where he lives, which is sizable enough, and there are precautions in place; however, how Maggie relates with other dogs is going to be an interesting situation. I hope beyond hope that it will be a safe and compatible one. I did tell Erik he needed to have a “Plan B” in place in the event Mags does not do well with his animals. This is, after all, Maggie’s home and I do not want her to be unduly stressed. I also don’t want my dog in a situation where she is bound to fail. During this time, I was also hired at the library at school where I have been volunteering. I am extremely pleased to be working with the children and with the books. I do love this work. I was given the excellent suggestion of doggie day care by cb from Contrafactual to care for Mags so she is not unduly in the crate while I am working. Also, when things looked bleak and I could not see my way past the two weeks Maggie was gone, I received a lovely coffee mug from Vanessa from farfetchedfriends. This mug had seven pictures of Maggie on it and it says, “Forever Our Girl”. I can’t tell you how uplifted and touched I felt after receiving that gift. Jamie says that Maggie returning to blogging will be “the greatest comeback in WordPress history” and I hope that he is right. For now, however, please wish us all luck, and lots of tail wags and dogsmiles. This entry was posted in Uncategorized and tagged dogs, family, library, obedience school, thank you on November 13, 2013 by maggie0019. It was a dark and stormy night. The car was packed with chew bones, rawhides, treats, and a two-week supply of food. All that was left was to grab the blanket and leash Maggie. “Damn,” I thought, “why did it have to rain tonight of all nights?” Maggie was due to be dropped off at the training facility by 8:30 p.m., and it was already pitch-black outside. Jamie took the red blanket, jagged with chewing at the corners, while I hooked Maggie to her prong collar. Jamie carefully and tenderly placed the soft blanket in the trunk of the Fiat, as though it was fine china that he was afraid of breaking. Maggie didn’t need much coaxing and jumped into the back seat of the little car, anticipating going for a ride with a wide smile and a tail-wag. As I backed Zeus out of the garage, the rain began to fall in earnest; bucketing down from the inky sky so hard I thought the car would get dented for sure. A few makeshift clouds scrabbled to take their place in front of the misty moon. Jamie cut the music off as I tensed behind the wheel, gripping it firmly at the 10-and-2 position, trying to keep from getting washed into the empty lots that were, at one time, going to be a pasture for rescued horses. Slipping unsteadily out onto the “busy street,” I drove through the rapidly-puddling water and tried to see where I was going. Zeus’ wipers beat steadily as Jamie and I tried to remain cheerful. “This is for the best,” I reassured Jamie halfheartedly. 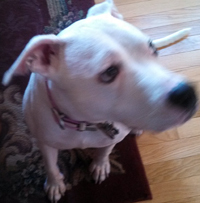 “Maggie is going to socialize with other dogs, and re-learn her commands. When she comes home, everything should be fine.” In the bluish-green light of the streetlamps, my son’s face gleamed an upset pale. He nodded, but I could tell he didn’t believe me. We white-knuckled it all the way to the facility. Maggie remained unconcerned, looking out the window at the torrent of water running down. Even with the wipers going full-blast, I was only able to see where we were going by the rear lights of the SUV in front of us and the “cats eyes” that lined the sloppy thoroughfare. By the time we pulled into the lot, I felt like I needed a drink, some migraine medicine, and a Xanax, not necessarily in that order. We walked into the office and the overpowering smell of wet dog hair immediately hit us like a wave at the beach. Jamie ran in the steady downpour back and forth to the car, unloading supplies, while I held on to Maggie (who was behaving nicely) and filled out paperwork. I was notified of which trainer would be taking Maggie home and given a cell number. Then, all too soon, capable hands took the lead out of mine and Maggie walked away to be with the other dogs. Maggie was excited and hardly gave us a backwards glance. I was glad it seemed easy on her for now. We squelched back to the car, not really caring about the rain anymore, and sat down dejectedly. Jamie didn’t exactly cry, but he did sniffle once or twice. I reached over and squeezed his hand. He squeezed back. Hard. The ride home was much the same, except for the gnawing, burning, acidic pain in my stomach, and the stone-silence of my sad-faced son. Jim took the events of the evening in stride when he came home from work. 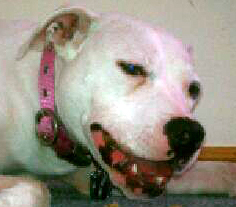 “She’ll come back and be a better-behaved dog,” he told us, with assurance. I looked at him. Jamie looked down at his plate and didn’t say a word. I went to bed, patting my mattress, looking for the white dog snuggled beneath the down comforter. But she wasn’t there. My hands reached out automatically, looking for her this morning; patting, patting, patting the emptiness. In my heart, I know that Maggie is in the best of hands, receiving the best of care, and this was the right thing to do. But still, we grieve at her absence, and hope and pray that bootcamp works. This entry was posted in Uncategorized and tagged bootcamp, dogs, driving, night, obedience school, sad, son, storms on October 31, 2013 by maggie0019. Mom and Dad are sending me to Boot Camp for sure. They don’t want to give up on me. Jamie is very relieved. Mom made the call to the Obedience School today. They are going to call back with the details and I’m going to be shipping out for two weeks. Mom’s arm is better. She’s been icing her wrist and leaving the prong collar on me. Thank you to everyone who sent their good wishes. I will keep you posted. 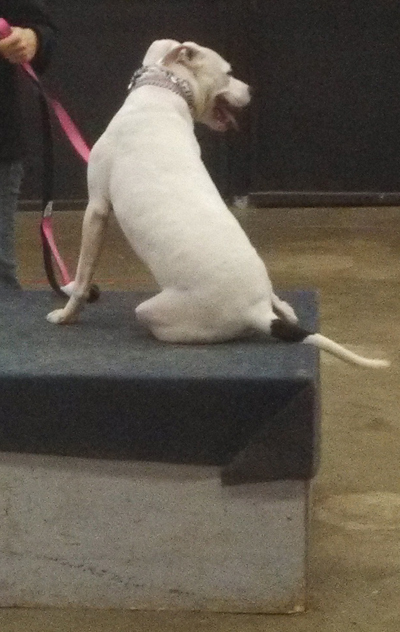 This entry was posted in Uncategorized and tagged boot camp, dogs, obedience school on October 20, 2013 by maggie0019. Razzum snazzum…computer issues all day! Finally get to post. I did not go to Obedience School this morning. Mom spent all morning in the bathroom. I kept looking at her like, “We are supposed to be somewhere! !” but…there’s an Imodium joke here somewhere. Seriously, there must be something “going around”, with Mom and Jamie taking turns getting sick. I hope my humans are all better soon. Next Saturday, Jamie and Mom are supposed to run a 5K. So I have to make up my classes during the week. Say, what’s a 5K anyway? Five different kinds of Kibble? I want to go and sample the Kibble! Although I will admit that I look a bit like “Courage the Cowardly Dog” in the above picture. What with it looking like my head is ten sizes too big and all. But you can see how sparkly-clean I am! The day had definitely taken an upward turn. Then Mom baked the Peanut Butter Puppy Poppers. And the day improved some more! 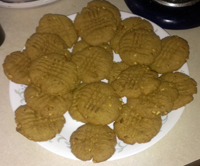 The only difference in the recipe was that Mom didn’t roll out the dough; she shaped them exactly like human peanut butter cookies. I have to say, the house smelled fabulous and the treats are outstanding. Mom says these are a great improvement on the liver biscuits she used to bake the Three Greyhounds. She says they loved the treats, but it made them all gassy at the same time – someone open a window just at the memory! Black Cat! Heaven forbid! My canine reputation is at stake, here! I avoided eye contact with her, but she noticed and reminded me that I have to wear the “Rufferee” costume. Now I don’t know which one is worse! Anyway, everyone is in a Fall mood. Besides the Peanut Butter Puppy Poppers, the house smells like pumpkin candles. Which, I have found, are quite tasty, once you get the cardboard box out of the way. Mom says I am going to make myself sick and put the candles on a shelf. This entry was posted in Uncategorized and tagged Aussie Pet Mobile, bath, Courage the Cowardly Dog, dogs, Halloween, hooky, obedience school, Peanut Butter Puppy Poppers, peanut butter treats, pumpkin candles on September 29, 2013 by maggie0019. I got my first taste of Advanced Training. Hoo-boy, I’m in for a rough ride and so is Mom. I’ve mentioned before about the chain-popping. The instructor explained this concept to Mom as not so much to choke the dogs, but because we don’t like the noise it makes. However, I have quite the lively personality and I’m quite strong, so some of the chain-popping was getting a bit tight. 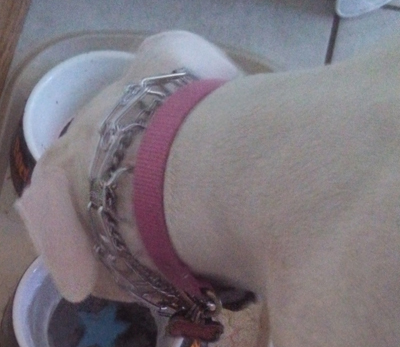 So they put me in a prong collar, which the instructors say is very common way of training larger, stronger dogs. The prongs are not sharp, and the collar looks quite fearsome, but what it does is exert pressure on the neck so there is actually less chain-popping and yanking and more like giving little tugs. Little tug + little bit of pressure = dog more likely to listen to command. So overall, although the collar looks worse, it’s probably better for me than all the popping. Not that I like it, though. I had a hard time minding my own business and keeping my eyes on my own paper during school. There were only three dogs in the class with me included, so we dogs got a lot of individual attention. We practiced moves that we learned in Basic Obedience, and a few new things; like having our humans sit in a chair while we sat next to them, then our people moved to the back wall and we had to stay seated. Let me tell you, it’s hard not to get up and follow! Then we had a U-turn “finish” that is similar to the “finishing” we had in Basic. We also had to do “figure 8s” around the other dogs. I had my turn sitting on the big Box that is in the middle of the arena. Yikes! Just don’t call me “spike”! It looks a lot worse than it is. Next week we will do more of the same plus a few more new things. Practice makes perfect! I know I can do this. After school next week, Max with the Aussie Pet Mobile is coming to give me another bath. It’s a nice reward for studying hard! This entry was posted in Uncategorized and tagged advanced training, bath, dogs, obedience school, practice, prong collar on September 22, 2013 by maggie0019.